One of my greatest weaknesses is beautiful pastry and dessert, so when I heard a new bakery had opened up in Old Strathcona, coffee and a sweet treat was my top priority this past Sunday morning. 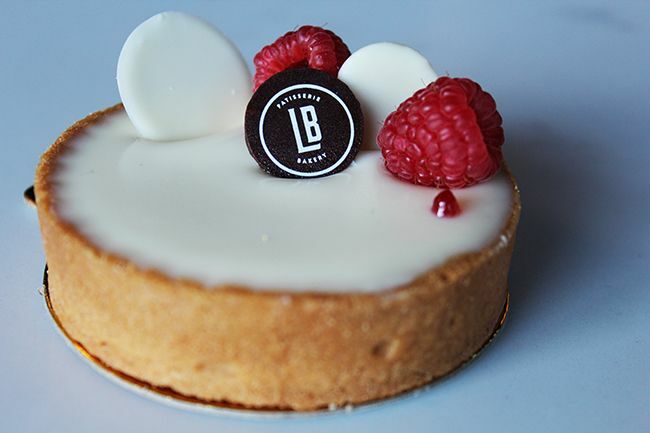 La Boule Patisserie + Bakery opened it's doors last Tuesday in a quiet area of Old Strathcona among other local independent shops and businesses. 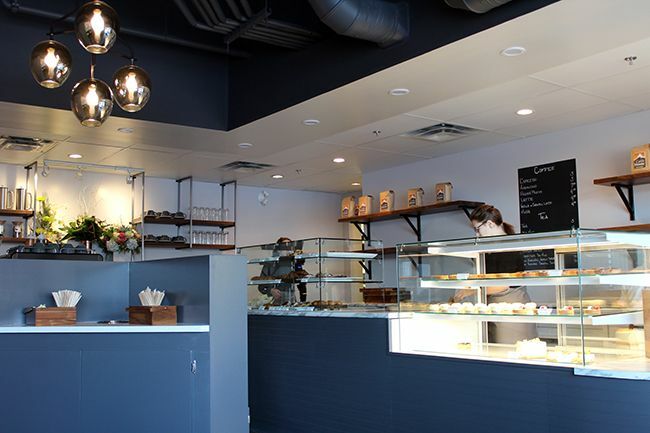 Jennifer Strang, former pastry chef at the Shaw Conference Centre, is owner and pastry chef of this new addition to the neighborhood. 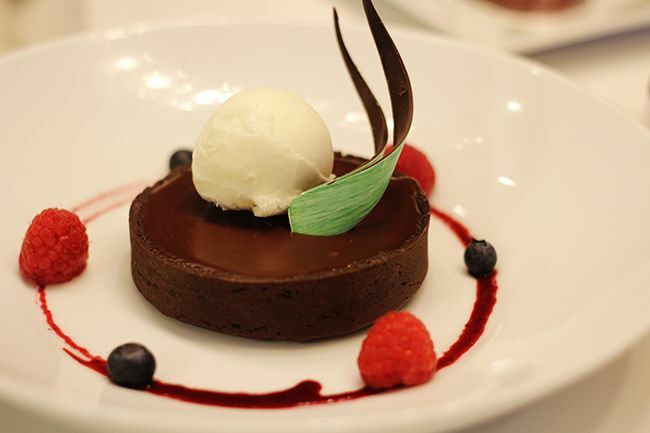 This information had me especially excited because the Shaw Conference Centre is home to some pretty incredible desserts. Walking up to the counter revealed three different pastry cases - one for eclairs, one for cakes and tarts, and a third smaller one for cookies, croissants, galettes, and scones. All of the options sounded delicious and it took all my self-restraint not to order one of everything. But that just gives me an excuse to return, right? 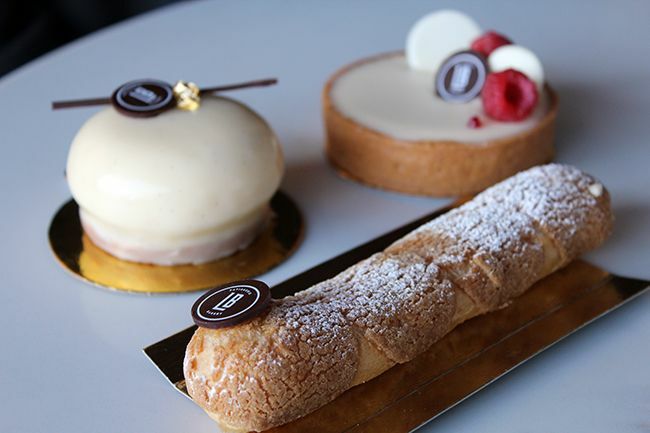 On this visit we picked out four different treats to try: the petit pain au chocolat ($1.25), a spiced apple eclair ($4), a white chocolate raspberry tart ($4.75), and a vanilla bean cherry cheesecake ($6). 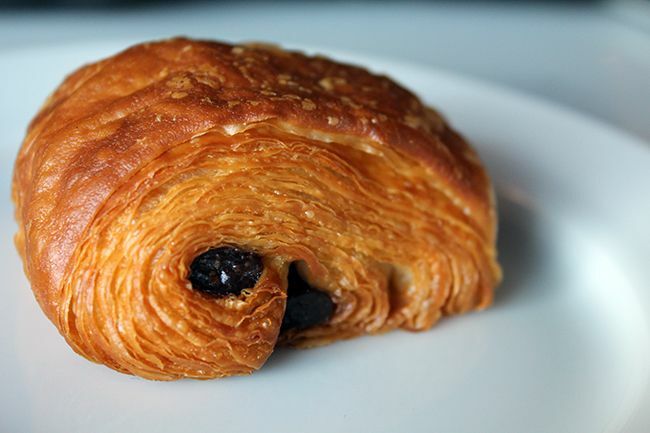 The mini chocolate croissant was the perfect three-bite pastry to have with coffee. Layers of crispy, flaky, buttery dough paired perfectly with the semi-sweet chocolate, making me almost regret not ordering the larger size. I'm not much of a white chocolate fan as I find it can be too sweet, but it was just right in the raspberry tart. The tart crust held together and was baked perfectly to not crumble apart. Each bite was creamy with just a hint of raspberry, so I found myself wanting more of the fruit flavour to come through. La Boule plans to eventually feature 9 different flavours of eclair, but during our visit spiced apple was the only one available. The pate a choux pastry had a nice rise, giving lots of space for the pastry cream to sit in. 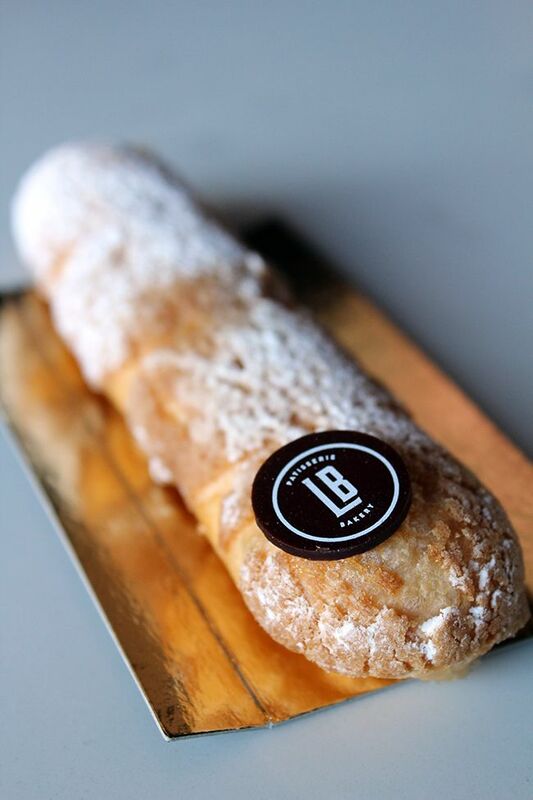 The spices were subtle and the eclair had great texture with the bits of apple in each bite. I can't wait to try out some of their other flavours, but for now, classic, black forest, and tiramisu are the other three available. The vanilla bean cherry cheesecake (left) was beautiful with a garnishing of dark chocolate and a leaf of edible gold. Breaking into the cake revealed a layer of cherry compote and a thin graham cracker crust. This cheesecake was nice and light, which was a nice change from the usual dense, rich cheesecake that we come to expect. La Boule serves coffee and espresso using Cafe Monte, a Calgary-based coffee roaster, and their tea blends come from UK-based Tea Pigs. 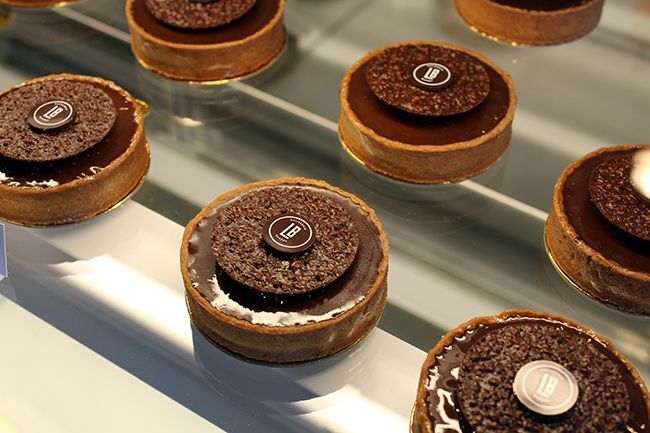 Depending on your drink and choice of pastry, a visit will cost you roughly $5-$10, which is very reasonable given the quality of the cakes and pastries you're paying for. 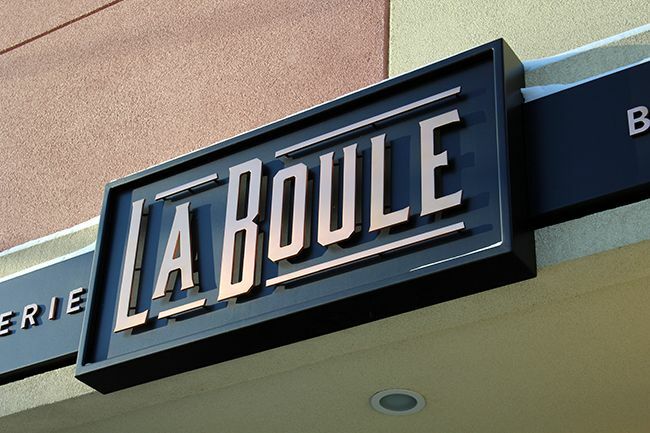 With just over a week since opening, I've seen nothing but high praise for La Boule on social media. 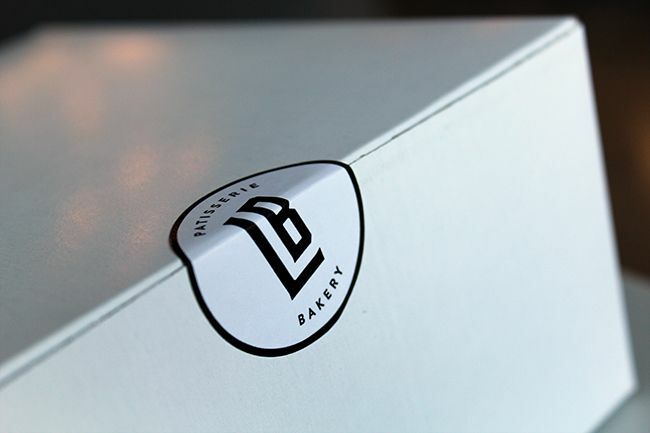 It's definitely well deserved and it's about time the south side of Edmonton got a pastry shop to call their own! Loaves and baguettes will be available in January as the team continues to test their ovens, but the future holds lots in store for La Boule. 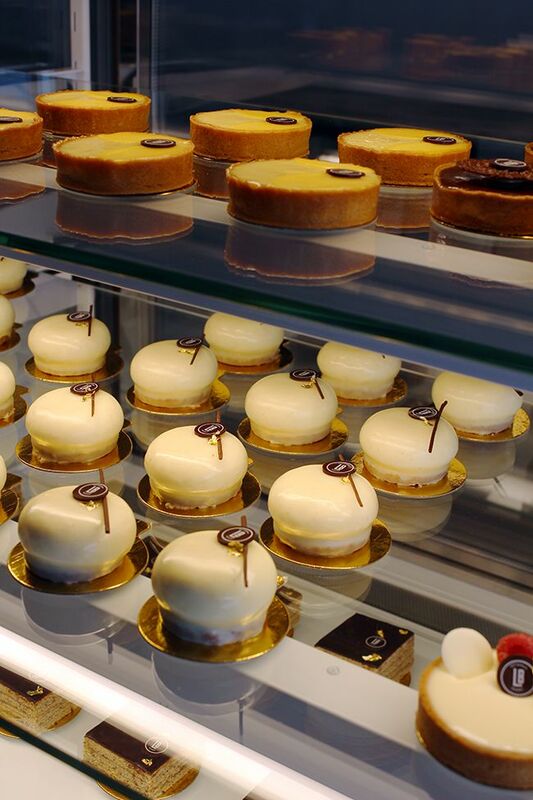 Stop by if you're in the area for some fantastic pastry! When it comes to travelling, there are two types of people: the people that like to arrive much earlier than their scheduled flight and the people that arrive last minute, just moments before the cutoff to check in their luggage. I find myself in the latter group, which is terribly frustrating for my boyfriend who is one of those people that like to arrive extremely early. 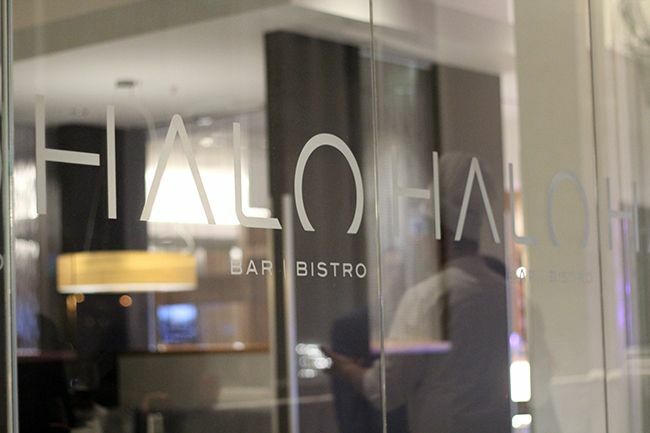 But after a visit to the Renaissance Hotel's Halo Bar + Bistro at the Edmonton International Airport (EIA), the two of us just might be able to make a compromise on our travel habits. Two weeks ago my boyfriend and I were offered the opportunity to spend a night dining at Halo with our friends Linda, Chris, and their partners. The EIA had originally contacted us separately to try out the many dining and shopping opportunities within the terminal, but they were more than willing to allow us to share this dining experience together when we asked. It made for a fun evening of catch-up and laughter, especially since my birthday was right around the corner. The hotel's General Manager, David Keam, and Director of Rooms, Sumit Bhatia, were our hosts for the evening, and their passion for the hotel and hospitality industry really came through. The Renaissance at the EIA opened two years ago as the only Renaissance Hotel connected to an airport. 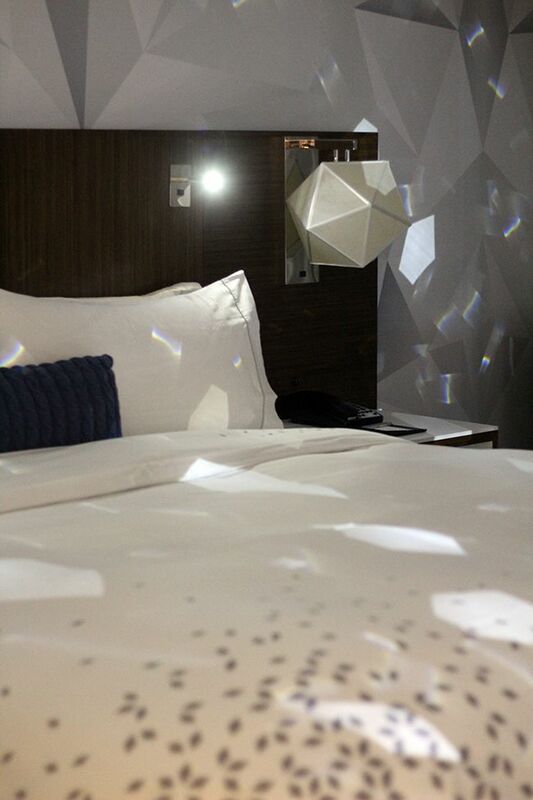 Most airport hotels are bland and not too exciting, but the Renaissance in Edmonton proves to be anything but. 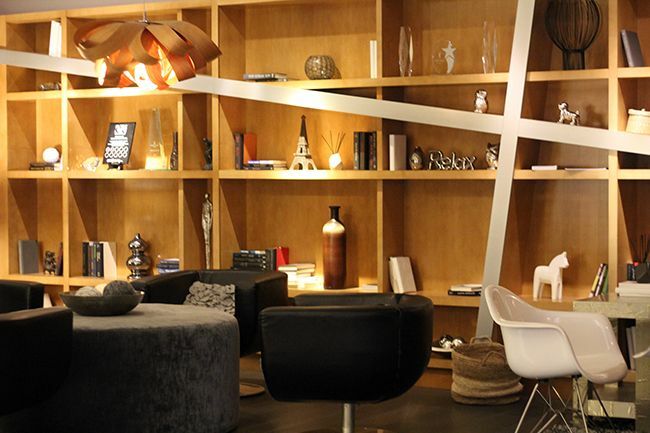 Designed by the same team behind the Cosmopolitan in Las Vegas, the Renaissance Hotel is sleek, modern, and many of their decor pieces invite you to discover more about the hotel itself. We started our evening by the lounge sharing casual conversation over some of their bar bites. Chef de Partie Daniel Ducharme gave an overview some of the plates we would be tasting throughout the evening and I was quite surprised to hear that Halo tries to incorporate local produce and ingredients wherever possible. This is fantastic though, as travelers staying in the hotel have the opportunity to see and taste the quality of the products from our local producers. As a group we got a taste of the fries, charcuterie, perogies, and calamari off the bar bites menu. 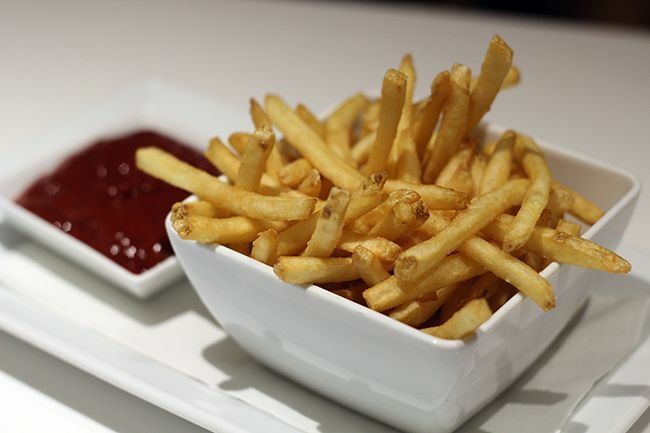 Saskatoon berries are abundant in our province so it was great to see them used in the housemade ketchup served with crispy french fries. 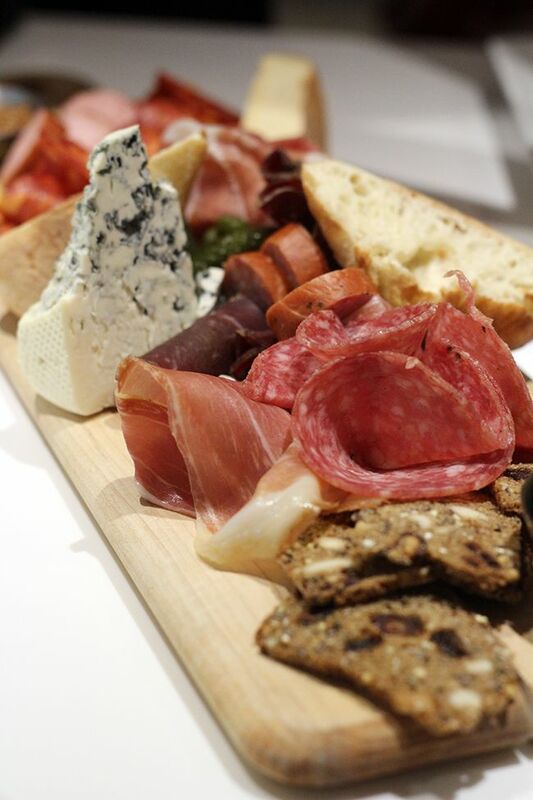 The beautifully presented charcuterie board featured a variety of cured meats, supplied by Canmore-based Valbella Gourmet Foods, and cheeses from across the country. The lightly breaded calamari ($14) was tender and had a bit of a kick with a dusting of togarashi and a dip into the ponzu sriracha aioli. The Nagy Mama Potato and Cheddar Perogies ($13) served with caramelized onion and kielbasa sausage are made by Baba's Own, a local Edmonton favourite. 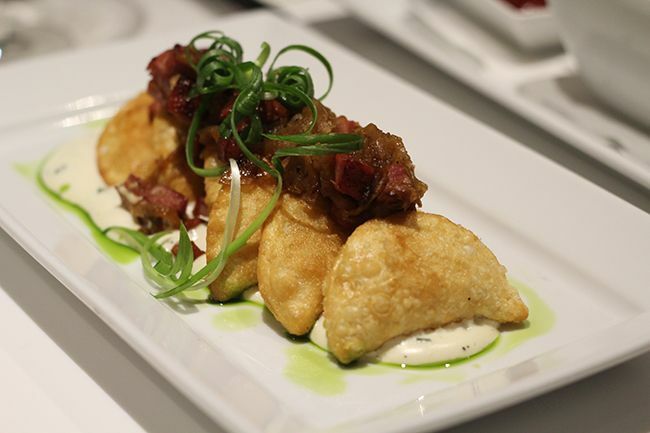 Fried to a bubbly crisp and served on a bed of chive sour cream, these perogies had great texture and flavour. These four dishes were just a snapshot of the many available on the bar bites menu, but they were great incentive to try more. 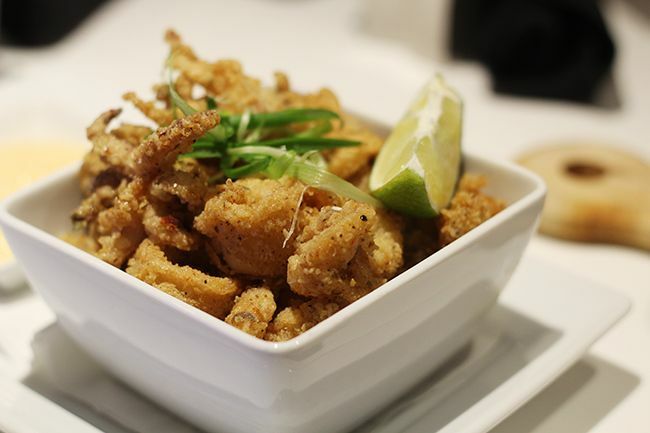 If you need more reason, appetizers are buy one get one free from 4-9pm every Friday, so you can end the work week on a high note. Or if you need a weekday pick me up, stop by for 'Bar Ritual' after a busy workday. At 5:15pm the siren signals the end of the workday, free drinks are passed around, and the all-Canadian music party starts with Kim Mitchell's Lager and Ale. 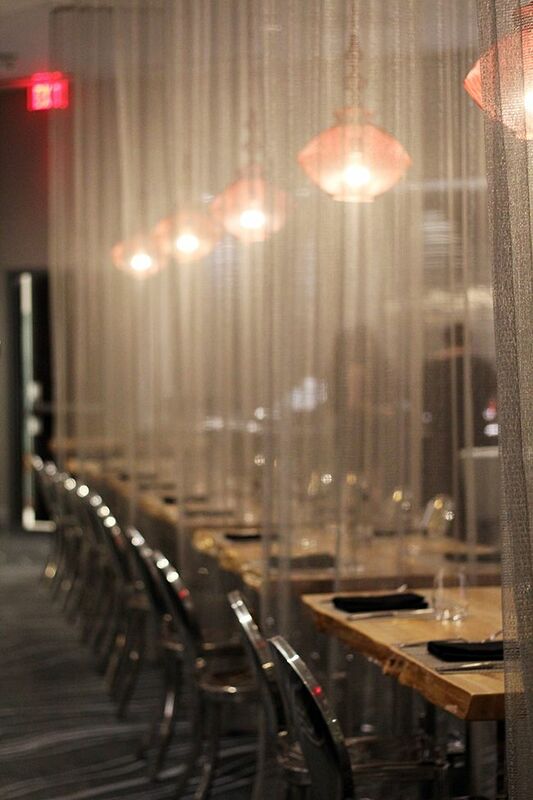 For our entrees we moved over to one of Halo's two private dining rooms. Each room can comfortably seat 8 guests and are equipped with televisions if they are needed, making them a great option for an intimate group dinner. As we each decided on our main dishes for the evening, the Duck Nuggets ($8) on the small plates side of the dinner menu caught my eye. I was hoping for morsels of duck in nugget form, but these nuggets came as full size tenders. The corn flake crust was beautifully golden and crisp, and the flavour of the duck was reminiscent of Chinese BBQ duck, especially with the five spice honey dip. As the entrees arrived to the table, each was beautifully plated with pops of colour. As it turns out, the three ladies at the table were drawn to the risotto, while the men ordered the beef short rib, chicken, and sturgeon off the menu. Gordon went with the Braised Beef Short Rib ($33) served with a warm grainy dijon potato salad, carrots, and Saskatoon Berry jus. The short rib was rich, and fall-off-the bone tender, the way short rib should be. 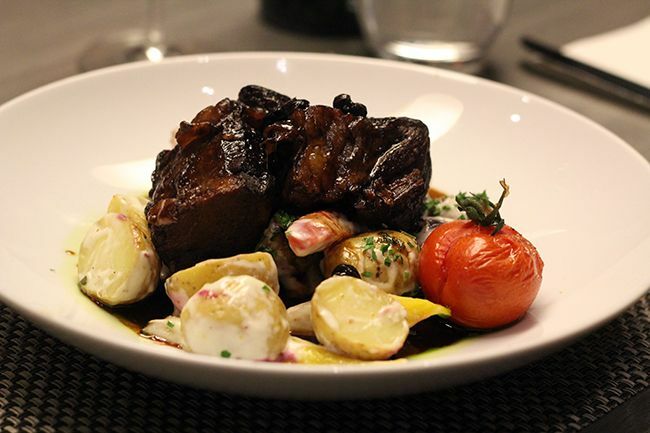 Halo typically serves a braised bison short rib, but there has been difficulty sourcing bison as local ranchers are getting better pricing by sending it south to our American neighbours. 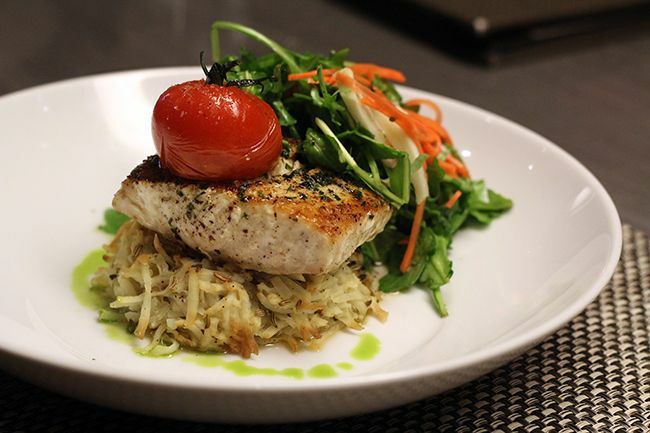 Chris went with the Sturgeon Fillet ($28) which was brown butter basted and served alongside fennel potato latkes, lemon vinaigrette, and a fennel and arugula salad. Aside from the latkes losing their crisp, there were no complaints. I'm a sucker for lobster risotto, so the Lobster and Forest Mushroom ($39) made with a variety of Prairie grains was right up my alley. 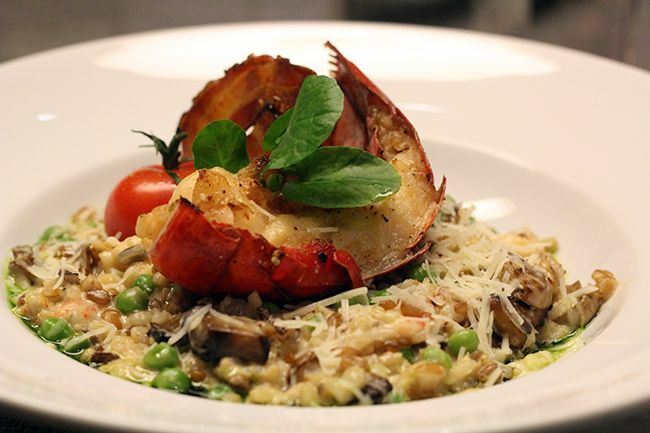 The full lobster tail served on the colourful risotto was stunning, and not a presentation you typically see. The use of 7 different grains rather than traditional Arborio rice gave the dish varying textures which kept each bite interesting. I almost prefer this version with the chunks of mushroom and mix of peas - that's how much I enjoyed it! Factor in the perfectly cooked lobster tail and this dish knocked it out of the park. After dinner we were taken on a tour of the hotel to see what it had to offer. Hotels under the Renaissance brand are typically a step above your average hotel, offering a clean, clever design to enhance your stay. 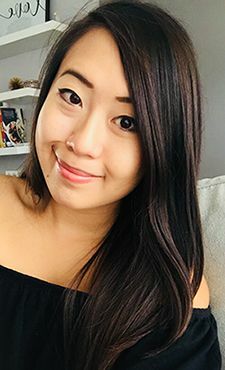 Staff are friendly and the 'Navigators' within the hotel (experts in local food, entertainment, and culture) are passionate about Edmonton and more than willing to direct you to places to check out in the city. The Renaissance Airport Hotel offers over 200 rooms, twelve of which are suites, one a beautiful penthouse suite outfitted with a remote-controlled $6000 toilet. Despite the differences, two things are consistent between them all - rooms are completely soundproof and each contains mirrors that reflect light to give your room a beautiful sparkle. The second feature was actually discovered by accident after the hotel opened! It's an incredible deal and you get to discover all that the Renaissance has to offer. Our evening ended with dessert served in a room tucked to the side in the hotel's banquet kitchen. This room is able to accommodate up to 8 guests and is the home to the Chef's Table that the hotel offers from time to time. A large window allows guests to watch the hustle and bustle in the kitchen, and a television screen gives an overview of the kitchen prep area. It would be so interesting to watch the kitchen operate on a busy night! 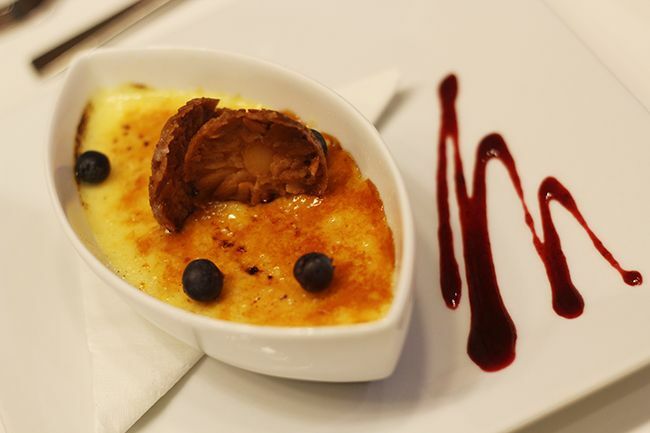 As we all shared a variety of desserts we realized that given the location of the hotel there isn't much competition for Halo, unless you consider Chartier in Beaumont, which is a completely different type of cuisine. 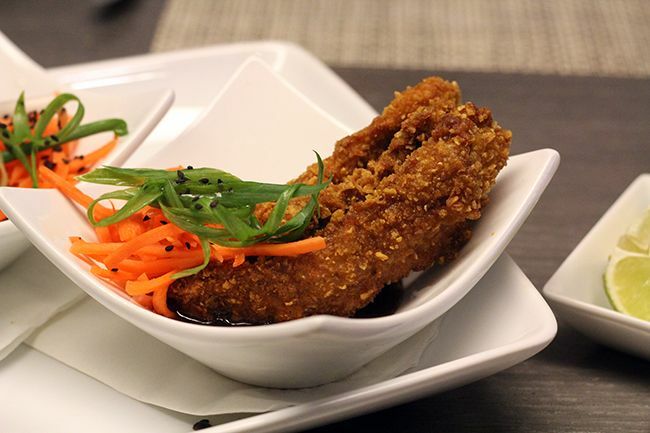 Halo's menu offers a wide variety for travelers (and eaters!) 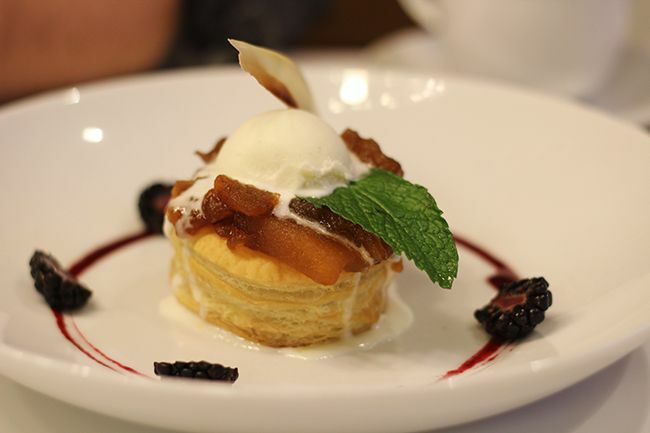 of all types, and they take pride in sourcing ingredients locally where possible. 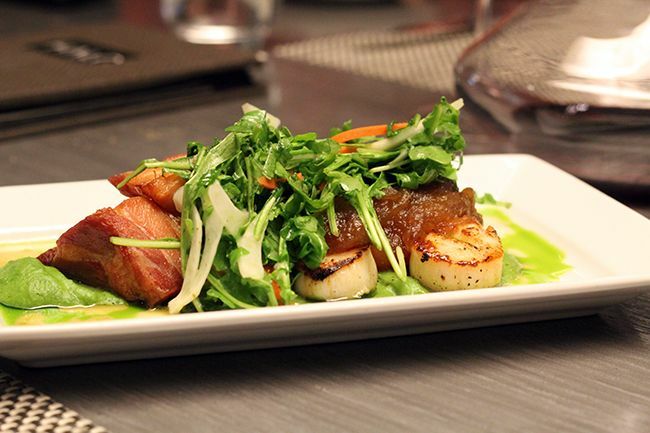 For some, it may seem a long distance to travel for a meal, but the food is worth your while. If I haven't convinced you to make the trip out for a meal, consider dropping by for some nibbles or a drink before your next flight. Or if you are picking someone up from the airport, arrive a little early and park in the hotel parking area. 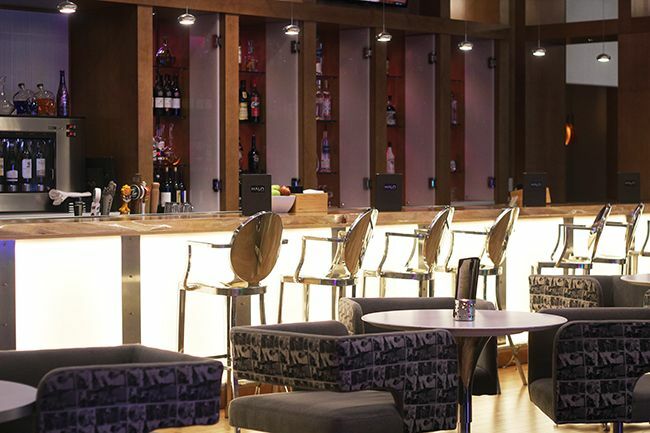 Grab a bite or a drink while you wait - there's a convenient pedway connecting the airport to the hotel, and you can get your parking validated. A big thanks to the Edmonton International Airport for coordinating the evening, and a huge thank you to the team at the Renaissance Airport Hotel for the hospitality and putting together such a memorable night. From this point forward it looks like I'll be arriving for my flights a little earlier, and my boyfriend has you to thank for that! psst, if you're a frequent traveler, make sure to sign up for EIA Rewards - it's a complimentary program that sends out monthly discounts for parking, shopping, and dining. Members are also entered into monthly draws for flight prizes! *Disclosure: I was contacted by the Edmonton International Airport to review a dining/shopping experience. Views expressed in this post are solely mine. This post is 100% my opinion, and as always, my priority is to you, the reader, to present an unbiased, thorough review.